Are we winning the war against ransomware and robocallers? Why is free Wi-Fi on JetBlue flights not necessarily a good idea? Do you know the easiest way to fix “Page Not Found” errors? And what is the hardest job on the Internet? Find out... in today's Geekly Update -- it's jam-packed with the latest tech news. This issue is guaranteed to make you 292% smarter -- you'll see why. Read, think, and, comment! 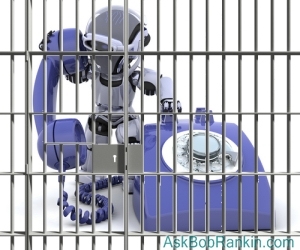 Two of the largest and longest-running robocall rackets were shut down this month. One of these loathsome companies was caught in 2014 and fined $4.375 million, but they continued robocalling, placing more than 1 million calls per week to people on the Do-Not-Call list. JetBlue is now the first airline to offer all passengers free WiFi on all flights. Great, now I have to share that limited bandwidth with a whole plane-load of Netflix binge-watchers. The Los Angeles Community College District paid $28,000 in bitcoins (the largest known payout) to have ransomware unlock its campus network, e-mail, and voicemail systems. Management figures it’s worth it because insurance covers things like this. Ransomware payouts in the US alone exceeded $200 million in the first quarter of 2016. Two Microsoft employees are suing the company because they claim they developed post-traumatic stress disorder as a result of their job. These members of the Online Safety Team were tasked with reviewing disturbing content involving child abuse, murder and other unsavory things, to determine if content should be blocked or taken down. Browser add-ons for Firefox and Chrome can be installed, allowing you to quickly search the Internet Archive for cached copies of a page that’s “404 - not found” in real time. Over 276 billion pages are archived, so there’s a significant chance you’ll find a page, even if it's no longer available on the website you're trying to access. But here's a browser extension that installs itself, without your permission. If you apply the latest Adobe Reader security update, you'll notice a new icon in the upper right corner of your Chrome browser window. The "Adobe Acrobat" extension lets you convert a Web page into a PDF (but only if you have the paid version of Adobe Acrobat), and also sends browsing data to the Adobe mothership. Yes, this is the same Adobe that makes the fatally-flawed Adobe Flash software. Hackers stole and published 900GB of data belonging to Cellebrite, the Israeli firm that sells its hacking and cracking services to government agencies. Last March, Cellebrite helped the FBI access data on the encrypted iPhone belonging to the San Bernardino terrorists. Phone numbers posted on Facebook profiles can be read by the public even when the user's privacy setting says they should be invisible. A Belgian security researcher demonstrated this hack by retrieving the “private” phone numbers of various Belgian politicians and Flemish celebrities. Facebook says it's a feature, not a flaw. A vulnerability in WhatsApp could expose messages to spies, despite end-to-end encryption. Yet another security hole allows hackers to take complete control of your Samsung SmartCam. The easy fix is to enable a piece of software in the camera that contains even more vulnerabilities. Samsung has also provided instructions for patching the flaw manually. Of course, there's always the Masking Tape Method. Most recent comments on "Geekly Update - 18 January 2017"
Besides my antivirus program, I've also begun using Cybereason on both desktop and laptop. It's free protection from ransomware and it keeps current with frequent updates. Just think, though: It's only going to get worse! Been with you, Bob, since Tourbus. I so enjoy your articles and perusing your website. Bob - Thanks as always for the comprehensive info. With these issues being the current (and future) state of the Internet, do you still opine that "free" Anti-Virus is adequate? I got a message from Chrome about that Adobe update and its extension, warning me that it would send info back to Adobe. I was asked if I wanted to remove the extension from Chrome, and I did. I had been worried that I had done the wrong thing by ditching it, so thanks for letting us all know about it. 292% smarter!?!!? Your Geekly Updates have really improved. Don't understand the Microsoft people suing the company. I'm sure if they didn't like the job they could have just quit. If that works, I've had a lot of jobs I didn't like. Didn't know I could sue the boss. Your link to the missing " January 12, 2017 Geekly Update" actually links to the January 5 update! Myself, I like best the report about Karma's payback on Cellebrite. What goes around comes around. Cool. Very good payback for routinely invading people's privacy. When they have real information and warnings, they chose to ignore it. But they want access to every bit of things you do with your computer and your phone. Fully agree with RichF. If you don't like the job then don't do it. This smacks of greedy opportunism and lawyers and I hope they get nothing. Far too much of this BS happening. 292%. That's a 75% increase. Who knew continuing education could be so effective and fun. Reminds me of my childhood when everyone in class looked forward to getting the Geekly Reader. In response to RichF and Denis, presumably these people were working for Microsoft prior to being assigned these duties. If their managers then assigned this work and they feared for their continued employment if they refused, I would say they have a case. I would not want to be forced to review all the worst of the internet as a condition of employment. I've heard of cops doing similar work who also developed PTSD. Horrible job but someone needs to do it - no way a computer can analyze the kind of crap that is out there. I like 146 percent smarter better. For the Microsoft article, their PAYCHECK is the compensation for doing that distasteful task, what idiots. To all those who are sniping on the Microsoft employees - how would you like to suffer a workplace trauma incident and have someone tell you "that's what you get paid for" or "quit if you don't like it"? You sound tough, but I wager you'd do just like they did. More compassion, less hatred please.